“The growing concentration of the world’s wealth has been highlighted by a report showing that the 26 richest billionaires own as many assets as the 3.8 billion people who make up the poorest half of the planet’s population. The rich get richer and the poor get poorer. Ever since I can remember I have been hearing this phrase. It is usually accompanied with a wry grin, as if to say, “That’s just the way it is and there’s nothing we can do about it.”. But is it just the way of things? Perhaps there is something we can do about it if we look at the roots of the problem hard enough. Because we are living biological beings, evolution has endowed us with vital needs that must be met in order for us to survive as individuals and as a species. Whatever we see as being beneficial in meeting our needs becomes valuable to us. These things matter to us because they help us survive and, in some cases, even thrive. I have written extensively about the fundamental differences between two ways of seeing the world and our places in it. On the one hand there is the fearful mindset and on the other the hopeful mindset. Which mindset we live by makes all the difference in how we structure our social institutions, including economic institutions and practices. This is because the two mindsets give rise to two very different sets of values. What we value drives our behaviour. We justify the choices that we make according to what we value, what we believe is important to meeting our needs either directly or indirectly. In other words, what we see going on in the world today is a direct result of choices made and actions taken based on the values we have come to adopt. 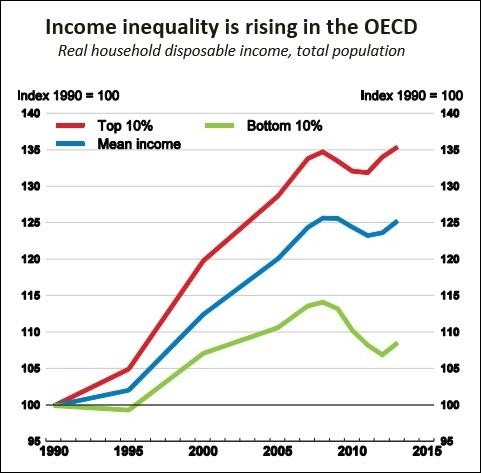 If we examine the basis for the fearful mindset and the values that naturally arise out of it we will see that, among other negative consequences, the extreme economic disparity identified so shockingly in the Oxfam report is no surprise. So, why are we, as human beings, operating, almost universally, from a fearful mindset? The fearful mindset arises naturally from an assumption we have been making since the dawn of humankind. Evolution has shaped us to see ourselves as independent individuals living in a world of independently existing things. As separately existing living things we understandably see the world as a place filled with possible dangers and threats to our survival. Nature has made sure that we pay attention to anomalies in our environment and that we err on the side of safety wherever uncertainty is to be found. We have an inherently negative bias. It is in this context that our values form. The fearful mindset is our default mindset. As such, it dominates the way we tend to interact with each other and our environment. Looking at the above table we see that from a fearful mindset perspective our need for safety can be met by establishing firm boundaries and creating clearly defined categories. Walls and militarily defended borders are examples of firm boundaries and such things as racism and stereotyping create exclusive categories. In the case of our need for security, the accumulation of resources seems prudent. If we are separate individuals or tightly bound independent groups competing for limited resources it makes sense to try to accumulate resources to the greatest extent possible. This strategy was not really a huge problem when we were scattered groups of hunter-gatherers scratching out an existence in an often dangerous environment. In today’s world, however, such an approach no longer works. In our highly populated world, interconnected by rapidly advancing technology, we can no longer operate under the misconception that we are independent, separately existing individuals or groups of individuals. At all levels of organization we are enmeshed in complex webs of interdependent relationships. Because we have largely been operating on the assumption that the accumulation of resources is the best way to ensure a secure future our economic systems and policies have been built to encourage the amassing of financial resources by those who are able and fortunate enough to do so. The problem with this, and the reason for the widening chasm between rich and poor, is that such a system grossly favours those with any advantages, earned or otherwise. There is a belief, often among the advantaged, that the rich get richer because they deserve it, because they, or their ancestors, worked harder or were smarter than everyone else. The name for this belief is meritocracy. Meritocracy contends that everyone has an equal opportunity to make a success of themselves, especially in a democracy where it is believed that everyone has the freedom to pursue economic wellbeing. In this belief system, if you are not well-off it must be because you haven’t tried hard enough. Of course, this ignores such things as devastation by natural disaster, serious illness, and being born into poverty or with a physical handicap. The fallacy in meritocracy is that we all are playing on a level playing field. This is obviously nowhere near an accurate representation of any society anywhere in the world. The truth is that not everyone has an equal opportunity to achieve financial success. Perpetuating the myth of meritocracy and serving to widen the economic gap is the so called, trickledown effect. According to the proponents of this theory, when the wealthy are given more advantages, often in the form of tax breaks, they will invest it in creating more jobs and will thereby improve the lot of the fortunate. The idea is that the increased accumulation of wealthy by the few will eventually get parcelled out to the working and middle classes. As the Oxfam report clearly points out, this is not happening. In fact, the opposite is taking place. Wealth is increasingly being concentrated in the hands of the top 1% of the population. Meritocracy and the trickledown effect are children of the fearful mindset. They exist because of the faulty assumption at the heart of this mindset, the belief that we are each independent, separately existing selves living in a world of mostly disconnected things. This misconception has been an unrecognized foundation of all human societies since the advent of our existence but it is only now that its terrible consequences are being felt worldwide. And, so, it is now we must act. The place to begin is to address the fearful mindset’s mistaken assumption. We are not independent, separately existing selves living in a world of mostly disconnected things. In actual fact, we exist as interdependent individuals in a highly interconnected world. The world and all of its creatures is one large ecosystem. Once we understand this a a deep level we can begin to see that the fearful mindset and its values are not serving our best interests. What we need is a mindset and a set of values based on the interdependent nature of reality so that we can live lives that are in accordance with the way things really are, as opposed to how they have previously seemed to be. This is what The Hopeful Mindset attempts to provide. If the fearful mindset’s values associated with our needs for safety and security are behind such global problems as economic inequality then it is hoped that values arising out of an understanding of nature might shed some light on a way of being in the world that could put us on the path to a better future. In looking at the values of the hopeful mindset we see that the values associated with our need for safety are flexibility and resiliency. An interdependent existence requires these values rather than the valuing of rigid boundaries and categories as found in the fearful mindset. It seems to me that valuing flexibility and resiliency could lead to social structures better able to cope with diversity and, in particular, inequality of any type. Moreover, if we look at the hopeful mindset’s value associated with the need for security we find that it is sustainability. 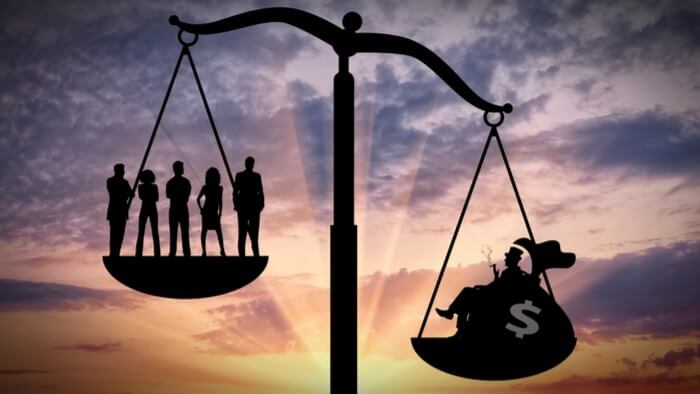 The trend toward concentration of wealth in the hands of a diminishing number of people is not sustainable because the gap between the rich and the poor continues to widen. It is only a matter of time before something has to give. We cannot continue to consign increasing numbers of people to poverty or a lowly standard of living. The French and American revolutions both erupted out of similar situations. A sustainable economy would be one in which there is a much narrower divide between those at the top of the economic ladder and those at the bottom. Such an economy would have mechanisms in place to ensure a more equitable distribution of wealth than the current systems with their playing fields heavily tilted in favour of the rich. The Hopeful Mindset does not spell out how such a system should be crafted, only that it would be consistent with natural systems if we did so. The hope lies in the idea that if we structure our institutions and organizations in ways that reflect the reality of interdependence (ways that support flexibility, resilience, and sustainability) the odds of surviving long enough to create a better future are enhanced. We know one thing for certain. We cannot continue to do business as usual.